We know that sounds like a fortune cookie, so let’s unwrap and chew on it a bit to digest the meaning. Marketing is about your business position. A local Chinese takeout restaurant with just one store occupies a much smaller market position than a national chain like P.F. Chang’s which is in every major city and the frozen foods section of every Walmart Supercenter. Whether local or national, each individual restaurant location also affects its market share. So, a freestanding restaurant will reach different customers than a competitor in, say, a mall food court or airport. And a high-traffic shopping district will supply more potential customers than a hole in the wall. None of that’s rocket science (or some ancient Chinese secret). We all know location matters, but what matters even more than geography is identity—who you are as opposed to where you are. It’s your place within the market itself. Are you fast food or fine dining? A low-cost Chinese buffet or high-cost, authentic Asian cuisine? Or maybe you’re like a hibachi grill where the customer experience matters just as much as the food. Whatever your position, it determines your prospects for growing the business and finding customers. Speaking of finding customers, that’s the point of advertising. Advertising is about your customer’s position. Like marketing, that obviously includes customers’ geography, but the location of their heads and hearts is even more important. What’s important to them? What are they seeking? Putting yourself in the customer’s place—seeing through their eyes and speaking their language—is fundamental to good advertising. At an even more basic level, you have to know where they go to learn and shop. Do they Google or Youtube everything, read Amazon reviews, rely on their Facebook newsfeeds (good luck with that), or visit brick-and-mortar stores to see products and people in person? Those are all legitimate ways to shop. You just need to learn which methods your customers prefer. That requires some trial and error. You try different advertising and communication channels, see what works, and adjust accordingly. That's our Yin Yang. Now let’s crane-kick it! To make the comparison easy, we’ve considered marketing and advertising side by side as if they’re on the same level, but actually they’re not. 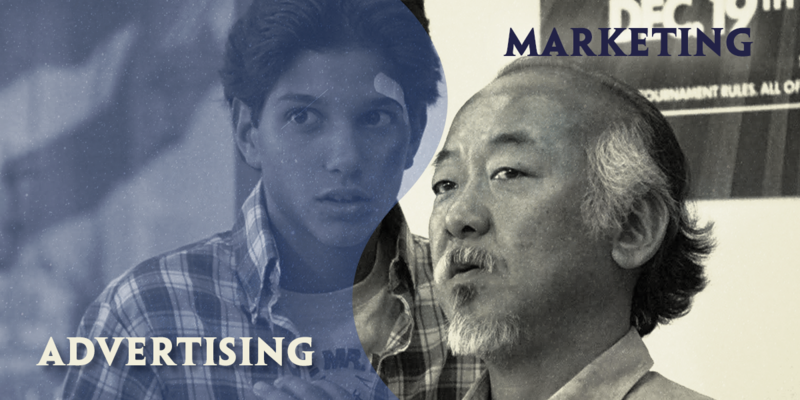 If you will, marketing is Mr. Miyagi, the sensei, while advertising is Daniel-San, the student. Marketing is the master plan with several disciplines beneath it, including market research, product development, sales, distribution, and yes, advertising. It's the star student because it’s so visible and attention-seeking. The other disciplines are sweating it out in the dojo while advertising is winning the All-Valley tournament. But even though it’s the star, it’s still under the tutelage of the master. 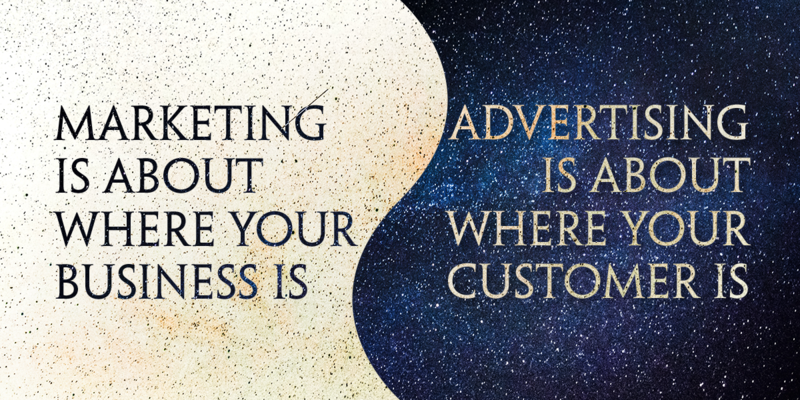 That may sweep the leg out from under our yin-yang analogy, but it underscores an important point: marketing must lead, and advertising must follow. Practically speaking, focus on your overall market position first. If you haven’t clearly defined who you are and where you fit, then your advertising doesn't stand a chance even if it's gutsy or clever. We actually see this pretty often in recruitment marketing. It’s not uncommon for a new prospect or client to have trouble pinning down their place in the job market. In turn, that makes advertising very challenging until we step back and determine their competitive position within the marketplace for employees. So, whether you’re seeking customers or employees, be sure to strike that balance of marketing first and advertising second. And if you're looking for a partner—someone to be the Yin to your Yang—let's talk.